Gerrit is an opensource web-based collaborative code review tool that integrates with Git. Gerrit provides a framework for reviewing code commits before it merges into the code base. The changes are not made a part of the project until a code review completes. Gerrit is also a good collaboration tool for storing the conversations that occur around the code commits. git config --global core.editor "text-editor-name"
Your name and e-mail address (including capitalization) must match what you entered when creating your LFID account. Cloning the code into a local workspace can happen via HTTP or SSH. Make sure your Gerrit settings are up to date with correct SSH and GPG keys. In the project’s Gerrit instance, we can see the HTTP and SSH commands. From the left side menu, select Projects->List->Select any project->General. Copy the desired clone command and paste it in your terminal. This option provides a more secure connection. We should always use SSH for pushing code unless the user is under a network that prevents SSH usage. In such case, use HTTPS. The SSH clone option will not appear if the settings are not updated with the correct SSH keys. Browse for the project’s General information. Click on the ssh tab. Since we are constantly working on uploading new code into the repositories, we recommend to use SSH clones since the remotes for pushing code get configured appropriately. This works everywhere, even behind a proxy or a firewall. Browse for the project and click General. For Gerrit < 2.14 the HTTP password is not the same as the Linux Foundation ID password. For Gerrit with HTTP configuration, the HTTP Password is in the User Name (Top right corner) -> Settings -> HTTP Password -> Generate Password. Both SSH and HTTP clone options have a clone with commit-msg hook which adds a hook to handle the Change-Id field in the footer of the commit message. The hook implementation is intelligent at inserting the Change-Id line before any Signed-off-by or Acked-by lines placed at the end of the commit message by the author, but if no lines are present then it will insert a blank line, and add the Change-Id at the bottom of the message. If a Change-Id line is already present in the message footer, the script will do nothing, leaving the existing Change-Id unmodified. This permits amending an existing commit, or allows the user to insert the Change-Id manually after copying it from an existing change viewed on the web. (Optional). To prevent the Change-Id addition, set gerrit.createChangeId to false in the git config. Create a local working branch, based on the branch you would like to make changes to. Replace origin/master with whichever remote/branch you need to contribute to. Typically master is the latest development branch. The ‘-s’ argument signs the commit message with your name and email and is a statement that you agree to the Developer’s Certificate of Origin. We recommend using git-review if possible as it makes working with Gerrit much easier. If your distro does not package git-review or you need a newer version. We can optionally pass the parameter -t my_topic to set a topic in Gerrit. Useful when we have related patches to organize in one topic. Once pushed we should see some output in the terminal as described in Gerrit Push Output. This method is a useful fallback in situations where we cannot use git-review. Where <remote> is the Gerrit location to push the patch to. Typically ‘origin’ but can also be ‘gerrit’ depending on how we have our local repo setup. Notice the word “for” is explicitly intending to perform the push into Gerrit. Using “heads” instead, will attempt to make the a push into the repository bypassing Gerrit which can come in handy for some isolated cases (when having force push rights). Another variable commonly used is “refs/changes/<gerrit-number>” which is an explicit way of making an update to an existing gerrit. In such case, is best to let gerrit handle this via Change-Id in the commit text. More options for this command: git-push. This output includes a URL to the patch. The number at the end is the patch’s change number. In a healthy Open Source project code reviews will happen and we will need to amend the patches until reviewers are happy with the change. This section will walk through the process of updating a patch that is already in Gerrit Code Review. The change number is in the URL of the Gerrit patch. For example if the URL is https://git.opendaylight.org/gerrit/75307 then run git review -d 75307 to pull the corresponding changes. (Optional) View information on the latest changes made to that patch. To view the edited files, run git show. To view a listing of the edited files and the number of lines in those files, run git show --stat. This is to ensure that the patch incorporates the latest version of the repo and is not out of date. Update the current patch description and then save the commit request. If you feel as though you added enough work on the patch, add your name in the footer with a line Co-Authored-By: Firstname Lastname <email>. You will receive 2 emails from Gerrit Code Review: the first indicating that a build to incorporate your changes has started; and the second indicating the whether the build passed or failed. Refer to the console logs if the build has failed and amend the patch as necessary. In the case where a patch depends on another in review Gerrit patch, we will need to rebase the commit against the latest patchset of the dependent change in Gerrit. The best way to do this is to retrieve the latest version of the dependent change and then cherry-pick our patch on top of the change. 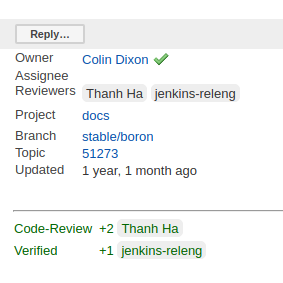 All contributions to Git repositories use Gerrit for code review. The code review process provides constructive feedback about a proposed change. Committers and interested contributors will review the change, give their feedback, propose revisions and work with the change author through iterations of the patch until it’s ready for merging. Managing and providing feedback for the change happens via Gerrit web UI. Change authors will want to push changes to Gerrit before they are actually ready for review. This is an encouraged good practice. It has been the experience of experienced community members that pushing often tends to reduce the amount of work and ensures speedy code reviews. This is not required and in some projects, not encouraged, but the general idea of making sure patches are ready for review when submitted is a good one. While in draft state, Gerrit triggers, e.g., verify Jenkins jobs, won’t run by default. You can trigger them despite it being a draft by adding “Jenkins CI” (or the corresponding Jenkins automation account) as a reviewer. You may need to do a recheck by replying with a comment containing recheck to trigger the jobs after adding the reviewer. To mark an uploaded change as not ready for attention by committers and interested contributors (in order of preference), either mark the Gerrit a draft (by adding a -D to your git review command), vote -1 on it yourself or edit the commit message with “WIP” (“Work in Progress”). Do not add committers to the Reviewers list for a change while in the pre-review state, as it adds noise to their review queue. Once an author wants a change reviewed, they need to take some actions to put it on the radar of the committers. If the change it’s a draft, you’ll need to publish it. Do this from the Gerrit web UI. Gerrit Web UI button to publish a draft change. Remove your -1 vote if you’ve marked it with one. If you think the patch is ready for merge, vote +1. If there is not an automated job to test your change and vote +1/-1 for Verified, you will need to do as much testing yourself as possible and then manually vote +1 to Verified. You can also vote +1 for Verified if you have done testing in addition to any automated tests. Describing the testing you did or did not do is typically helpful. Gerrit voting interface, exposed by the Reply button. Once the change gets published and you have voted for merging, add the people who need to review/merge the change to the Gerrit Reviewers list. The auto-complete for this Gerrit UI field is somewhat flaky, but typing the full name from the start typically works. Reviewers will give feedback via Gerrit comments or inline against the diff. Updated versions of the proposed change get pushed as new patchsets to the same Gerrit, either by the original submitter or other contributors. Amending proposed changes owned by others while reviewing may be more efficient than documenting the problem, -1ing, waiting for the original submitter to make the changes, re-reviewing and merging. Download changes for local manipulation and re-uploaded updates via git-review. See Update an existing patch above. Once you have re-uploaded the patch the Gerrit web UI for the proposed change will reflect the new patchset. Reviewers will use the diff between the last time they gave review and the current patchset to understand updates, speeding the code review process. Iterative feedback continues until reaching consensus (typically: all active reviewers +1/+2 and no -1s nor -2s), at least one committer +2s and a committer merges the change. Once a patch has gotten a +2 from a committer and they have clicked the submit button the project’s merge job should run and publish the project’s artifacts to Nexus. Once completed, other projects will be able to see the results of that patch. This is important when merging dependent patches across projects. You will need to wait for the merge job to run on one patch before any patches in other projects depending on it will successful verify. You must have SSH keys for your system to register with your Gerrit account. The method for generating SSH keys is different for different types of operating systems. The key you register with Gerrit must be identical to the one you will use later to pull or edit the code. For example, if you have a development VM which has a different UID login and keygen than that of your laptop, the SSH key you generate for the VM is different from the laptop. If you register the SSH key generated on your VM with Gerrit and do not reuse it on your laptop when using Git on the laptop, the pull fails. Save the keys, and add a passphrase for the keys. Your public key is now available as .ssh/id_rsa.pub in your home folder. Click Sign In to access the repositories. Click your name in the top right corner of the window and then click Settings. Click SSH Public Keys under Settings. In the Add SSH Public Key text box, paste the contents of your id_rsa.pub file and then click Add. While we recommend you submit patchsets over SSH some users may need to submit patchsets over HTTPS due to corporate network policies such as the blocking of high range ports or outgoing SSH. To submit code to Gerrit over HTTPS follow these steps. This guide uses the Linux Foundation Gerrit server and the releng/docs project as an example. Differences may vary with other Gerrit servers. Required when uploading patches to Gerrit servers <= 2.13. In Gerrit 2.14 and newer use your Linux Foundation ID password. Due to a bug in git-review, you need to download the commit-msg hook manually to the .git/hooks/ directory or git-review -s will fail. Because git-review attempts to use SSH by default, you need configure the git-review scheme and port through git-config in the repository. The Gerrit context path on the Linux Foundation Gerrit server is infra/. Others Gerrit servers may use gerrit/ or r/. Otherwise git-review will still request your Gerrit username, indicating a configuration issue. The following instructions work on a Mac, but the general approach should be the same on other OSes. # pick 1 for "RSA and RSA"
If you are collaborating in keysigning, then send the output of gpg2 --fingerprint $KEY_ID to your coworkers. Install gpg, instead of or addition to gpg2. you can tell Git to use gpg by doing: git config --global gpg.program gpg2 but that then will seem to struggle asking for your passphrase unless you have your gpg-agent set up right. We can create a signed commit with git commit -S and a signed push with git push --signed on the CLI instead of configuring it in config if we want to manually control which commits use the signature. Create a signed commit with git commit -asm "test commit"
This will result in Git asking you for your passphrase. Enter it to proceed. The signing a commit or pushing again with a signed push is not recognized as a “change” by Gerrit, so if you forget to do either, you need to change something about the commit to get Gerrit to accept the patch again. Slightly tweaking the commit message is a good way. To do this, navigate to Gerrit and check for a green check next to your name in the patch. Example signed push to Gerrit. Code contributions to Linux Foundation projects must have a sign-off by the author of the code which indicates that they have read and agree to the DCO. Refer to https://developercertificate.org/ for original text. git-review defaults to the local branch name as the topic if it does not match the upstream branch. Both methods achieve the same result so is up to preference. Further documentation available at Gerrit Topics.